Hunt horses are used to be surrounded by hounds. Sometimes they will run right between their legs! For the first time in the eight or nine years that I’ve been hunting, I saw a horse kick a hound. It was horrible. The hound got nailed — twice. It was howling in pain. I didn’t see the first kick but I did see the second and I don’t ever want to see something like that again. The good news was that while seriously injured, the hound will recover. Not to hunt again; she will be adopted as a pet by a member. But she will be okay. At the check, the hounds beg for treats. It is a mortal sin in foxhunting for your horse to kick or step on a hound. The problem is, you often don’t know how your horse will react to the hounds until you try them in the hunt field. In this case, the horse hadn’t hunted before. It was already hyped up from the experience and the hounds poured down the trail from behind and one of them brushed against the horse’s hind leg. So it’s understandable, but not forgivable. Most of the time if your horse kicks a horse, that horse will not be invited back. How do you train your horse to handle the hounds running between their legs? Some of it is innate — if your horse already likes dogs, it’s much easier. Freedom, in particular has always loved dogs. He loves to bury his nose in a dog’s coat and snuffle them all over. One of the cutest things I’ve seen is when a puppy started licking his nose. They were both so happy! 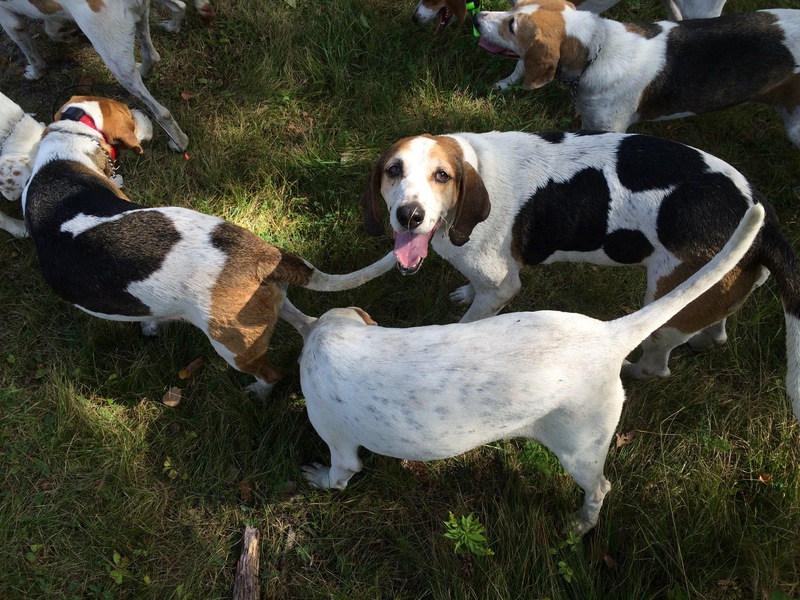 Take your horse out roading the hounds if your hunt offers the opportunity. The first times you hunt, stay toward the back of the field — most of the time this will give your horse the chance to watch from a distance. Whenever you are watching the hounds work or pass by, make sure you are facing the hounds. If your horse threatens to kick, discipline him swiftly. Introduce your horse to hunting slowly. There are a lot of things for your horse to get used to out in the hunt field. Get them acclimated by starting in the second field where it’s less exciting and don’t be embarrassed to come in at the first or second check if you think your horse has had enough. Most horses will learn to hunt safely and enjoyably. However, if you horse really doesn’t like dogs, you may need to find another job for him. So glad that pup will be able to retire and have a happy home. When I lived in Chicago a woman from my building owned a foxhound. I always thought that was peculiar–a foxhound in an apartment building in the city. The lady did therapy work with her lab and those dogs were her passion.. 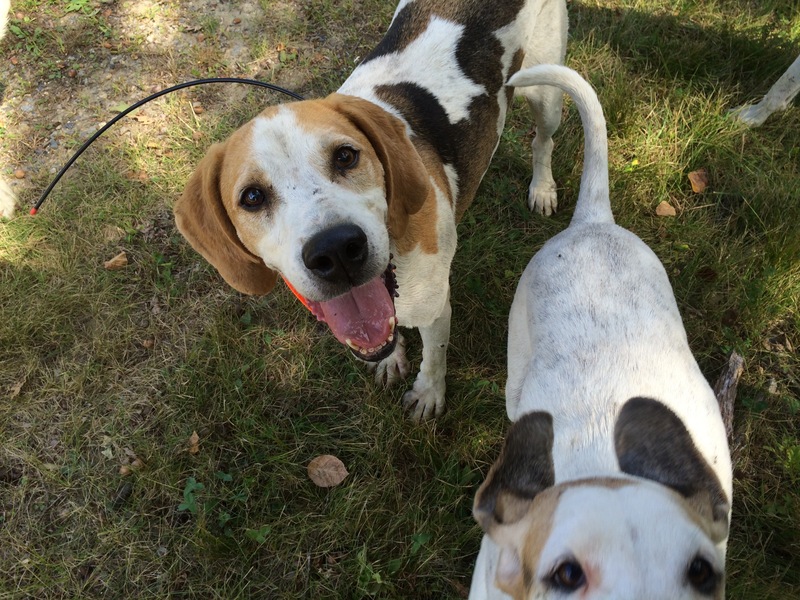 Retired foxhounds make great pets! Several of our members own them. They are very sweet. I was really worried when the hound was first kicked because she was lying on the ground and howling. Within a few minutes she was able to stand and one of our members dismounted and waited with her until someone came to carry her out to the hound truck. Luckily, no bones were broken only tendon/ligament damage. That must have been scary to experience. I really hope to not experience that again. One of the hardest parts was not knowing how the hound was while we finished the hunt. It was a great relief to find out she will be okay. I’m glad she is going to be ok! aww poor pup! glad she will recover! great tips tho – i’ve known plenty of horses who are good around dogs, and some others who were decidedly NOT….